Government yesterday briefed embassies accredited to Zimbabwe, United Nations and other partners on Tropical Cyclone Idai flood induced disaster, key priority interventions, immediate and short term requirements. Local Government, Public Works and National Housing Minister July Moyo, who headed a delegation of Ministers, told the diplomats that the nation was trying to recover psychologically, socially and economically following the demise of its citizens, displacement of populations including refugees at Tongogara Transit Camp and destruction of infrastructure due to the impact of the tropical cyclone. “In Manicaland the cumulative number of deaths is 179, burials (102), unidentified bodies buried (12), injuries (186), missing people (329) and displaced (6 788). The number of children affected (3 500), displaced refugees (2 000), number of casualties airlifted to Skyline (52), houses affected (7 703), food insecure population (40 064) and number of bridges damaged (11),” he said. Minister Moyo said the numbers were rising as search teams intensify their work. “Over the hill there is a settlement called Rusitu famous for growing horticulture, bananas and other food stuffs. There people also come to assemble to trade and when we are analysing those who are missing some of the people who are missing are not necessarily from that area and also this has been worsened by the fact that some bodies were washed into Mozambique and the Mozambican villagers buried eight of those but before they buried them they took pictures,” he said. Minister Moyo said the numbers of missing people is also increasing because the list was arrived at following consultations with village heads and chiefs. He said Government was looking at the roads and the bridges and in two to three days it will come up with an estimate of costs after Transport and Infrastructure Development Minister moved most of the provincial road engineers to assist in the evaluation of each and every bridge. Minister Moyo said it was amazing that companies had donated plant and equipment. They also seconded engineers and provided fuel. 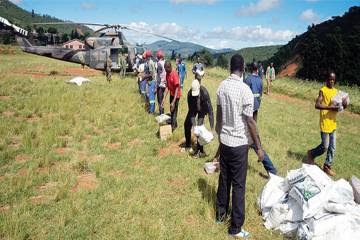 “There are ongoing efforts by the Zimbabwe National Army and Airforce of Zimbabwe to dispatch relief and to reach inaccessible areas. There is urgent need for aviation and ground fuel, transportation and plant and equipment, rations, protective clothing and other relevant consumables. In education emergency funding has been availed to rehabilitate or reconstruct some schools. However there are funding gaps,” he said. Minister Moyo said the massive flooding damaged water supply infrastructure in Chimanimani, Chipinge, Mutasa, Buhera and Mutare. Affected sectors include, health, agriculture, roads, communication infrastructure, environment, wildlife, forestry, industry, commerce and energy. Information, Publicity and Broadcasting Services Minister Monica Mutsvangwa said the importance of physco-social support could not be overemphasised. “I was able to get into Chimanimani using a helicopter because there was no other way. Roads have been opened so that trucks could begin to go with food. We are very proud of the people of this country as well as well-wishers from other friendly countries who responded overwhelmingly,” he said.